Cotton blend new Hanes Premium Style Ringer boxer briefs/ Stafford Ringer in fun colors, ringer colors that border the boxer briefs, are customized for packing. Limited stock currenlty available. OUT MEDIUM, no longer available. This item has front fly access. The Natural or Commando is now available in sizes S-XL in athletic style Boxer Briefs. Made with moisture wicking material that dries quickly. The waistband rests just above your hips, leg band hits your upper thigh. A TKW PackRight harness, made of soft elastic and nylon, holds the packer in a 1 1/4" c-ring with or without specially designed ball cage. If you pack with GV Sailor, you need a ball cage to hold your packer securely. Jockey Sport: low rise provides a tailor fit, Stay dry fabric helps pull moisture from your skin so you stay cool & dry. One pair per order. Limited color selection as we buy in assorted packs. Some of the Jockey do not have a working fly, please indicate in comments if you need a style with fly. 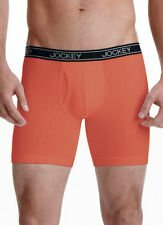 Comfort Flex� waistband keeps its shape wash after wash.
Jockey� Stay Dry Stretch Boxer Briefs. We got a great deal -we are passing those deals on to you! We carry black, red, blue and grey, our choice. Please list color choice # we'll fill if we have your size. Choose from any one of the 3 BulletBriefs inserts for a secure, confident packing experience. Not all designs have a working fly, please indicate in comments if you need a style with a fly. More you buy, the cheaper per pair they become! PRICE FURTHER REDUCED! Just got a deal! These garments help cool the micro-climate surrounding your skin to maintain your ideal skin temperature. Originally developed for NASA, Outlast(R) technology has demonstrated its temperature regulation for more than 20 years. 100% Combed Cotton. This item is for one pair of packing underwear. We get these in random grey, white & blues. 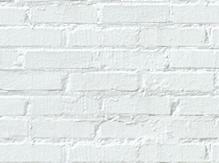 Please list at bottom of comments your color choice and we'll try to fill if available in your size. 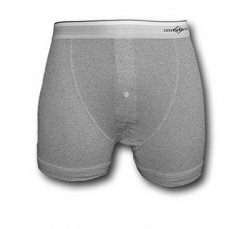 The Snuggler is now available in athletic style Trunks for sizes S-XL. Made with sleek, moisture wicking material that dries quickly. We have a few high quality brands, all distinguished as performance or athletic style by the manufacturer. 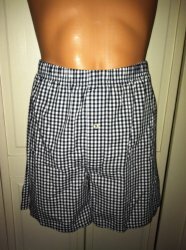 I have some sizes and colors in the low rise version, meaning the waistband rides below the belly button, riding on the hips. **PLEASE NOTE: Athletic sizes run smaller than standard underwear - please choose accordingly.